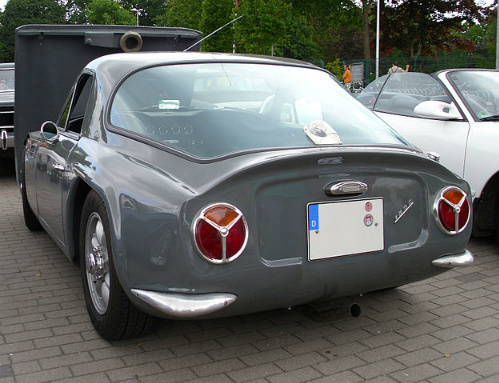 In 1963, the Grantura Mark 3 sports car was launched. This followed the fact that, by the end of 1962, TVR was in receivership but, by 1963, Grantura Engineering regained control, and resumed production. The Mark 3 featured a new space frame chassis, designed by John Thurner, which provided additional rigidity and strength, with coil spring independent suspension all round. This was a marked improvement over cars built before 1962, which used VW-based suspension, that gave the cars the reputation of being "bone shakers". The wheelbase was increased by 1.5 inches, which improved stability, and created more interior space. The new chassis would subsequently form the basis of that used in TVR's up to 1972. Early Mark 3's tended to use the Coventry Climax 1.2 litre, single overhead cam engine, as used in the Lotus Elite, whilst the later variants were fitted with the 1622 cc unit from the MGA Mark 2. Another alternative engine was the Ford 1.5 litre unit from the Ford Classic saloon. The company now produced a number of the suspension components themselves, whilst the running gear was sourced from Triumph. Powered by the 1622 cc engine, and using two SU carburetors, the Mark 3 had a top speed of 107 mph, a 0-60 mph time of 9.6 secs, and developed 90 bhp at 5500 rpm. Unfortunately, as a result of the company's precarious financial position, only 60 units of the Mark 3 were built. In the Summer of 1964, the Grantura's body was restyled to incorporate a Manx-style rear section, an enlarged rear window, and the very distinctive circular rear lights as used on the Ford Cortina Mark 1 saloon. As a result of this restyling, the spare wheel was now positioned above the floor of the boot, which meant that the wheels' extra weight was no longer behind the back axle. Early production units were designated the Mark 3 1800, whilst later units were classified as the Mark 3 1800S sports car. The car was powered by the BMC B-Series 1798 cc engine, as used in the MGB, which developed 95 bhp at 5500 rpm, and produced a top speed of 114 mph, with a 0-60 mph time of 9.9 secs. In 1965, production of the Grantura sports car was halted, whilst the company endured another financial restructuring. Although bankruptcy loomed once again, it was fortunate that the company was acquired by garage owner Martin Lilley, which enabled TVR Engineering to recommence production. This Mark 3 variant was phased out in July 1966. It is worth noting that a team of three Mark 3's were entered in the Sebring 12 hour race, whilst another three car team competed in the Le Mans 24 hour race. In the Autumn of 1966, the Grantura Mark 4 sports car was introduced and was, essentially, a refined and improved version of the Mark 3 1800S. Several improvements were made to the interior, including the heating and ventilation systems, in order to improve comfort of the occupants. There was an attractive wooden dashboard, the springs and dampers were modified to produce a smoother ride, there was a larger fuel tank, and the engine was moved slightly further forward. Although these changes marginally increased the weight of the car, this was more than offset by the increased performance of the larger engine. As was the case with the Mark 3, early production was designated the Mark 4, whilst later units were classified as the Mark 4 1800S. Production of the Mark 4 was short lived, with it ending in 1967 when the Grantura model was replaced by the TVR Vixen. A 1963 TVR Grantura Mark 3 having almost completed a full rebuild would be valued at around £10,000/$16,000. On the other hand, a 1965 Grantura Mark 3 1800S with a rebuild almost complete would be worth around £12,000/$19,000. In contrast, a 1966 Grantura Mark 3 1800S in excellent condition would command around £30,000/$50,000.